Florida is a state on the south east part of the US, right on the Atlantic Ocean. The name Florida comes from the spanish word for flower. It's nickname is The Sunshine State, and the motto is In God We Trust. Since Florida sticks out into the ocean, it is called a peninsula. Florida's flag has a big red X on a white background. That is known as St. Andrew's Cross. This was the flag of Spain a long time ago, and Florida used to be owned by Spain, so their flag is a part of their history. 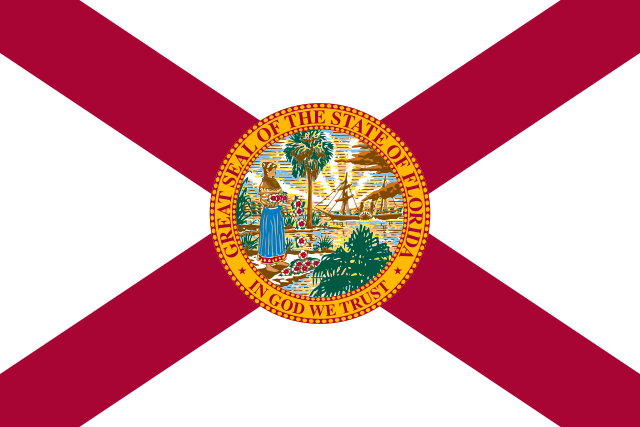 In front of the red X is Florida's state seal. The state seal of Florida has a Native American woman spreading out hibiscus flowers. There are palm trees and a steamboat in the background. 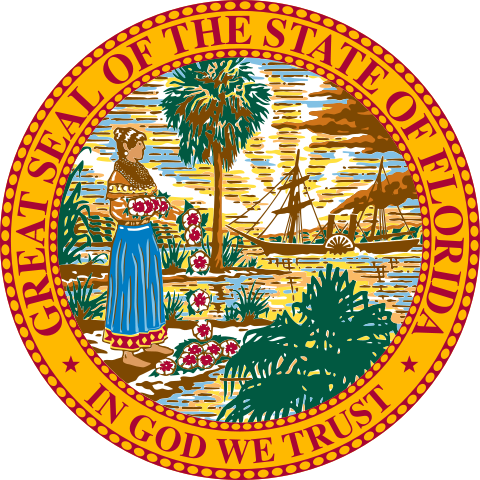 The words on the seal say Great Seal of the State of Florida and In God we Trust. Since Florida is on the ocean, it has lots of interesting wildlife, like the American Alligator, the leatherback turtle and the manatee. Kennedy Space Center is in Florida, where they launched the space shuttle Columbia. Walt Disney World is the largest and most visited amusement park in the world.